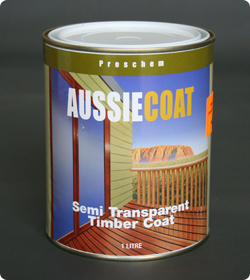 AUSSIE COAT is a water based Semi-Transparent timber finish. It’s designed for use on Outdoor Timbers such as Windows, Decking Outdoor Furniture and Doors. It has a slight pigmentation for UV but will have a semi-transparent satin coat. This will enable the natural features of the timber to be seen. Timber finishes like AUSSIE COAT will protect the timber from weather. It will expand and contract to allow some normal timber movement. Aussie Coat is recommended for popular timbers such as Cedar, Merbau, Cypress Pine, and Australian Hardwoods. Previously painted surfaces must be completely stripped back to bare timber. It is recommended to apply a timber cleaner (oxalic acid) such as Preschem Grey Deck Cleaner followed by power washing the timber surface. Timber with tanin, iron or mould stains needs to be sanded or treated with mould killers such as Preschem D-Mould. This will ensure Aussie Coat has a clean timber surface to adhere to. IMPORTANT: This product is a timber coating and whilst it does penetrate, it can trap foreign matters left on the timber surface. We cannot guarantee that tanin or mould may not develop under the surface of this coating at a later date. Timber is a natural product and can be unpredictable. We recommend applying 3 coats with the first coat applied on wet/damp timber. Ensure a clean dry surface free from dirt, grease and wax. Apply the 1st coat of Aussie Coat on wet or damp timber to enhance penetration of the mouldacide. Apply liberally and allow to dry. Apply further 2 coats of Aussie Coat. Allow 2 hours between coats and ensure surface is touch dry prior to re coating. Mix well prior to application and during the application process. Application can be made with a pad type applicator and brushes. HVLP and airless sprayers can also be used for large vertical areas. Use of rollers is not recommended for application. Avoid lap marks by maintaining a wet surface in the application area. Application in temperatures above 32°C or below 8°C is not recommended. Application in direct sunlight may cause poor adhesion. Do not apply too late in the day and be careful of applications where rain may be expected within 6 hours. Surfaces that make contact with Aussie Coat such as doors may be sticky if not let to dry properly before re-contact. The condition of the coating should be assessed every 18 months. Further coatings should be applied prior to the coating breaking down (cracking or peeling). Clean area to be re-applied with powerwasher and reapply minimum of 2 coats. The surface can be very slightly moist on the first coat. If the coating has broken down, it is recommended to strip this back to raw timber before reapplication. Rough Sawn approx 6-8 m 2/Litre. Application equipment is cleaned in water. Available in 1, 4 and 10 litre cans. Avoid skin contact by wearing protective clothing. Don’t breathe vapour or spray mist and provide ventilation. Keep out of reach of children. If poisoning occurs, contact a doctor or Poison Information Centre (13 11 26).